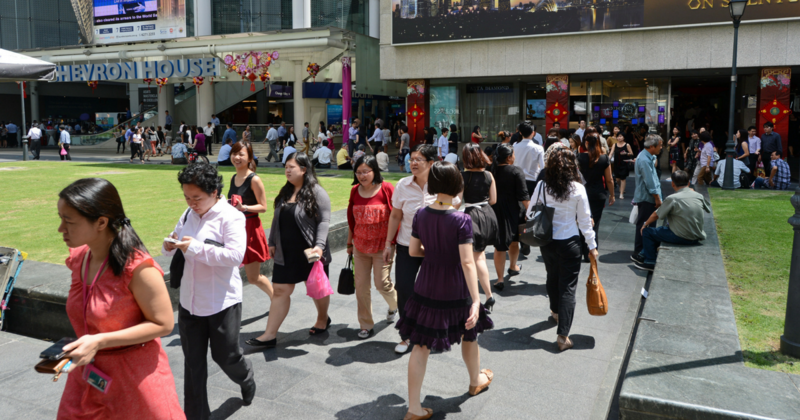 Online job portal, Monster, has just released its recent report on Singapore’s job market for the past year. The forecast is “gloomy”, and according to their findings, “Singapore saw a 3% year-on-year decline in online hiring activity in August 2017”. The MEI was launched in 2014. Using data they collected since January 2011, Monster Singapore analyses the online job demand in Singapore based on their “real-time review of millions of employer job opportunities”. Between August 2016 and August 2017, the MEI showed an overall 3% fall in online job recruitment in Singapore. 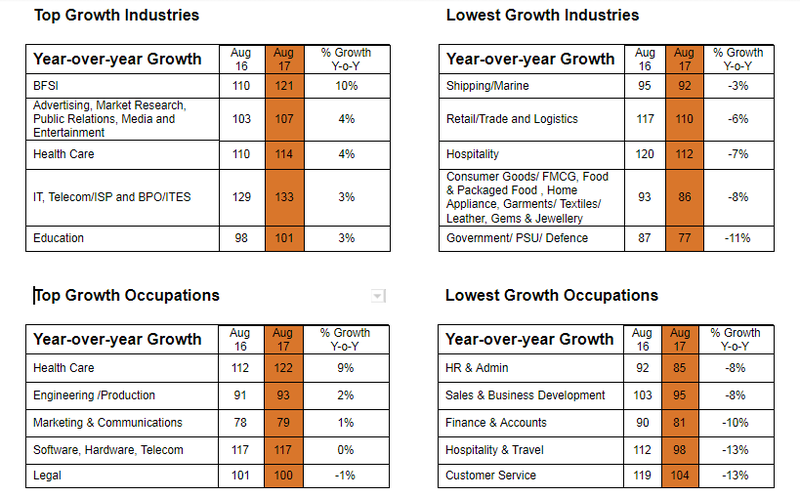 The BFSI (Business, Financial Services and Insurance) sector was found to have the highest growth in online hiring activity, for the third consecutive month, at 10% year-on-year. While the Government/PSU/Defence sector is reported to suffer the most decline at 11% year-on-year. By occupation, Health Care professionals were in the most demand amongst employers, seeing a strong 9% year-on-year growth in hiring activity. While the demand for Customer Service professionals has the sharpest drop in online hiring at 13% year-on-year plunge. 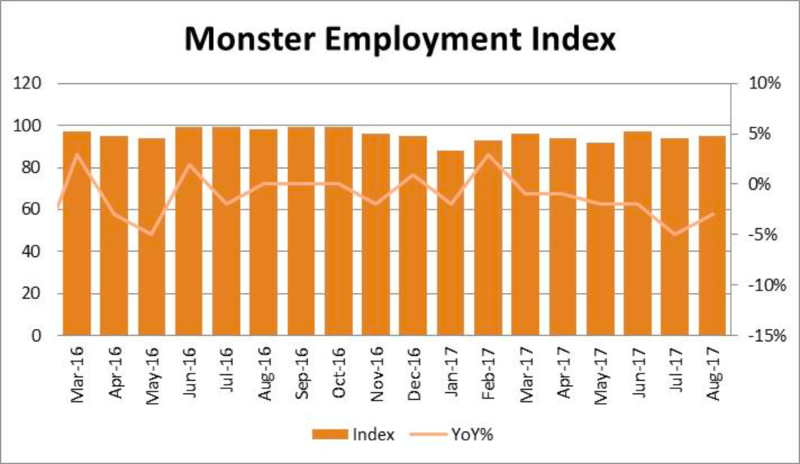 Managing Director of Monster.com – APAC and Middle East, Sanjay Modi, said that economists expect the economy to improve by 3.1 per cent in the third quarter but will slow down to 1.8 per cent approaching the end of the year, according to the latest MAS survey. And despite strong steps by the government, we are unlikely to see a drastic improvement in Singapore’s labour market will remain soft in the short-term. He cited “business restructuring, talent shortage, skills mismatch and shifts in the labour force” as some problems facing the Singapore jobs market. The healthcare sector is “growing rapidly”, aligning with the MEI, which he attributed to the republic’s ageing population.